Whew. Depending on how you view the current market you are either relieved, thrilled, or in pain. Regardless, I think it’s safe to say a significant number of us are at least happy to see some price action and movement. And there is volume here in this move, which is very, very important. The key psychological price of 5000 has been breached for the first time in 2018. This represents new lows for Bitcoin and the entire cryptocurrency market. In November, so far, Bitcoin has dropped significantly. From the open on November 1st of 6360 to the new 2018 low of 4863 made today, Bitcoin has dropped -23.54% this month. The majority of the drop has been over the past 5 trading days beginning with the 1100 point drop on the 14th. 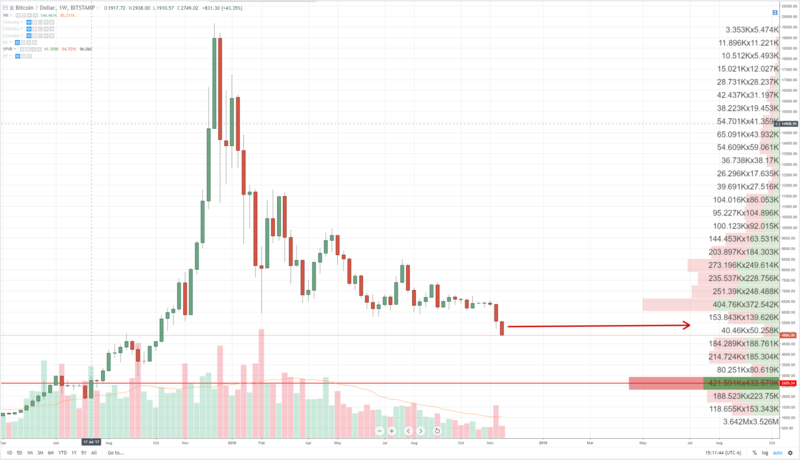 Thus far, we have seen Bitcoin lose -75.55% of its value over the past 337 days – a -15,028.99 point loss.. One of the underlying technical causes of the significant drop over the past 5 days has been the result of a low volume node, or a volume trough in Volume-At-Price analysis (VAP). VAP differs from normal volume analysis in that VAP looks at volume traded at a particular price. When prices moved below the 6000 value area, it entered into a low volume node and promptly traded lower and faster. The low volume node of 5900 – 5300 accounts for less than half of the volume traded at the VAP price node of 6550 – 5900. The move lower was exacerbated by the presence of the next volume node below: the 5300 – 4600 node. That particular node represents even less volume than the 5900 – 5300. In fact, when looking at the entire volume profile beginning with April of 2017, the 5300 – 4600 node is the lowest volume node over the past 600 trading days. In VAP, traders look for high volume nodes and low volume nodes. High volume nodes, such as the 6500 – 6000 node represent areas of strong support and resistance because they represent significant volumes of participation. Traders also look for low volume nodes, which represent areas that have not experienced significant participation. The behavior of price action, when price enters into low volume nodes, is of particular interest to traders because those zones act as a kind of ‘vaccuum’. It is very common to observe price very swiftly and rapidly move through low volume nodes. I’ve discussed this scenario as recently as a couple weeks ago, indicating that a swift move out of consolidation into the 4800 – 4500 zone would be a likely scenario to drive prices higher. Volume has certainly come back into Bitcoin. The volume from Sunday to Monday has thus far generated almost half of the entire prior week’s volume and, with the exception of last week, is higher than the past 4 weeks. Volume precedes price as they say.